Listen up, ladies! We always put so much effort and excitement into the dress for our big day, but what about the shoes? Everyone thinks because the dress will cover them up, they don't need to be anything spectacular...but they are so wrong! Shoes are making a huge comeback with brides today, and they're not holding anything back...brides are going from fancy and bejeweled, to vibrant colored and stunning! We love the shoes in the top photo, they're so elegant! 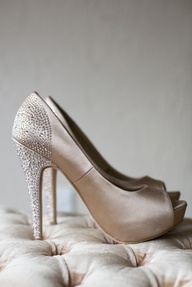 They are bejeweled but solely in the back and down the heel, which is a very unique look and provides lots of detail. Sometimes less is more! On the other hand, the bottom photo shows that less is more, really is only "sometimes". Take these signature Christian Louboutin's, for example. They are neutral in color, and simple yet so detailed at the same time. The beautiful beige detail with the classic red soles make these shoes absolutely stunning! They're so different compared to just any off-white satin shoes (which are also gorgeous, of course). Another huge trend we're seeing lately is colored shoes for your wedding day! If you're like me and love bright colors, this would be perfect for you. It adds a pop of color and detail to your overall look and also adds a fun touch to your photos! More and more lately we're seeing brides use writing on the soles of their shoes; a love note from their groom, the words "I Do", or "Mrs. ____". It can be whatever you want to write, but I love the idea of writing a special something between you and your groom on the soles of your shoes and walking down the aisle in them...it's so romantic! If you want to add fun color into your wedding day, but your shoes aren't going to show through your dress - enter bridesmaids! Pick a vibrant color for your bridesmaids' shoes as an alternative. Having multiple pairs of bright shoes will compliment your dress and, believe it or not, make you stand out more! Now, I don't know about you, but I'm ready to go shoe shopping... These gorgeous, vibrant and elegant wedding shoes bring a whole new level of excitement for your overall gorgeousness on your big day! More and more brides today are stepping outside the box and choosing something daring and exciting for their big day...now we know why! I just would like to say a remarkable thanks to the journalist of this share.Perfect creativity and ways to symbolize the entire concern.Wising to have some more beneficial ideas from your aspect. Thank you so much! You can also follow us on Facebook under Dana Markos Events!